Dress cute and casual with this checkered style ruana wrap! An effortless way to get a chic look whether you're traveling on an airplane or sitting around a bonfire, this ruana looks fabulous over a pair of jeans and a t-shirt! Available in multiple colors this checkered ruana is an accessory every woman needs! The ruana wrap is crafted from 85% Irish lambswool and 15% nylon for a warm yet lightweight and soft blend that drapes beautifully. The shawl is one size fits most measuring approximately 54" by 72". The checkered ruana is authentically crafted in Co. Kerry, Ireland by Kerry Woollen Mills, one of the only surviving woolen mills in the area, crafting creating beautiful wool items for over 300 years! Get a gorgeous wool ruana wrap for any time of the year! Checkered ruana wraps in a variety of lovely colors! 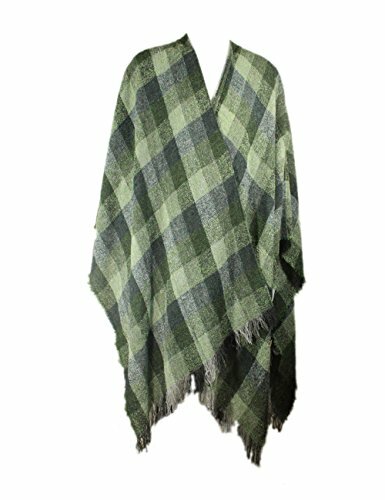 Crafted from 85% Irish lambswool and 15% nylon for a soft and warm shawl! If you have any questions about this product by Biddy Murphy, contact us by completing and submitting the form below. If you are looking for a specif part number, please include it with your message.